We are excited to now be offering Embrace as the latest and greatest new scar therapy treatment. It not only flattens and smoothes new scars but actually takes the tension off of the scar for the initial healing period. We are thrilled with our patient’s results. Results that leave little to no visible scar! Scars are a natural part of the bodies healing process and form when the dermis is damaged. The body forms new collagen fibers, a naturally occurring protein in the body, to mend the damage resulting in a scar. New scar tissue will have a different texture and quality then the surrounding tissue. Research shows that wounds turn to scars when they are subjected to a high-tension environment. 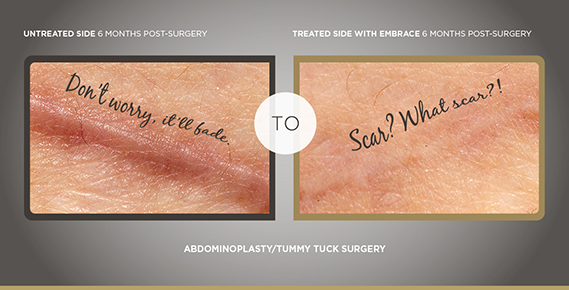 EMBRACE scar therapy is a silicone sheet that shields the incision and gently draws together both sides of a closed incision, relieving skin tension for a thinner, smoother, lighter scar and significantly reduces the appearance and texture of scars. Each sheet is typically applied 2-4 weeks after surgery on a closed, dry incision and is used for a minimum of 8 weeks. If you are interested in learning more about this amazing product please give our office a call at (949)548-9312. We would be more than happy to discuss the application or answer any questions you may have!